Home / Unlabelled / 2019 ELECTIONS: TONY ONEWEEK RELEASES APGA MUSIC. SAYS IT'S RING TONE FOR ALL SOUTH EAST. 2019 ELECTIONS: TONY ONEWEEK RELEASES APGA MUSIC. SAYS IT'S RING TONE FOR ALL SOUTH EAST. The irrepressible Gyration master and former Minority leader Hon Tony Oneweek Muonagor has released a single titled NKEA BU NKE ANYI. The four minute song is an emphatic melody driving deep sensitization of the Igbos towards the realization that APGA is their own. The beat is different from his usual rhythm of Gyration but current and dynamically weaved around the lyrics which includes the APGA anthem. 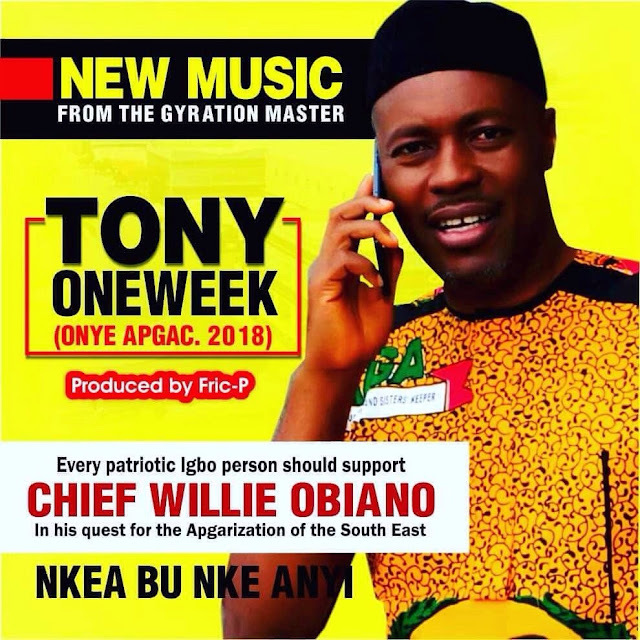 Tony Oneweek who recently returned to APGA said the song is dedicated to his Leader, Chief Willie Obiano (Akpokuo dike Global) the Champion of the Apgarization of the south east. He implored all members of APGA nationwide to use the song as their ring tones as the first major identification of who they are and where they belong. The opening lines of the song says ABUM ONYE APGA. Imagine the announcement whenever you receive a call. He wishes all aspirants on the APGA party platform the best of luck in the primary and pledged his full commitment to delivering victories to all candidates of APGA in Anambra state. "We will campaign for you. We will make jingles for you. We will work assiduously for your success" He said.